Dominion Brewing struck a chord with Delaware and local beer drinkers several years ago when it began introducing what the brewery now calls its Pin-Up series of beers. The beers (which I refer to on occasion as “the bomber series”) began as seasonal offerings in 22oz “bomber” bottles with artwork that harkens back to the posters favored by G.I.s in World War II. The series became so popular that Dominion had no choice but to expand their availability by offering them in 12oz six-packs individually, or in a rotating sampler case dubbed The Pin-up Pack which now comprises of Double D IPA (All year), Morning Glory Expresso Stout (All year), Candi Belgian Triple (Fall/Winter) and Abbey Ale (Winter/Spring) and Gigi’s Farmhouse (Spring/Summer). 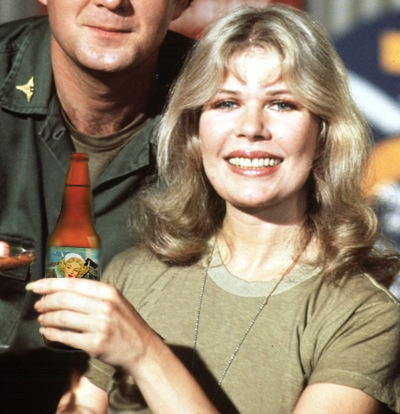 In an interview I did back in January, CEO Jim Lutz informed me that they were brewing test batches with the plans of adding another girl to the group this summer, Hop Lips, the brewery’s first IPA but because the beer was in its early stages, there wasn’t much he could tell me about it at the time so I simply made a mental note to keep an eye out for it. And now it’s available, so let’s taste. 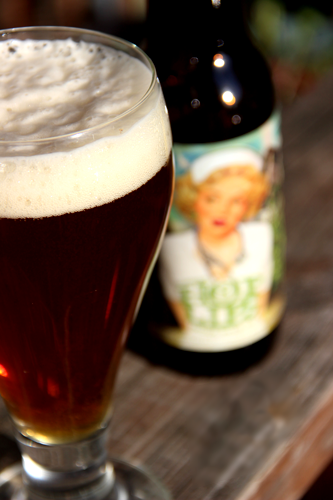 THEM: Hop Lips (whose pin-up girl is named Hannah) is built on a grain bill of Munich, Crystal and wheat malts. Her lips get their hoppiness from Nelson-Sauvin, Cascade, Select and Crystal. The beer clocks in at 6%ABV and 45IBUs. ME: Good looking beer. Dense foam head, lace, decent carbonation. The nose is filled with hop contributed aromas like florals, tropical fruits and some straight forward cascade goodness. The taste is right in line with aroma. The hops aren’t over powering, but they do tip the scale slightly to their favor over the malt base. I’d say the mouth feel is about medium, although it does finish a little watery on the back end. In some beers this could let the hops linger, which they do, leaving a light tingle and a hint of astringency in your mouth, but Hop Lips never builds to the point of being overly bitter or bitey. Hannah is worthy of being the next pin-up girl. She’s pretty well balanced, has a nice hop profile and drinks pretty quickly. When Jim described his future 6.0% IPA to me as “sessionable”, I admit I chuckled a bit, but it wasn’t lasting long in my glass. She’s definitely more in line with an American IPA style, as opposed to and English style I recently talked about when I reviewed 16 Mile’s Inlet IPA. For Dominions first offering in the IPA style I think they hit the mark pretty well. As far as where it falls with the rest of the brewery’s beers, Double D is still my favorite with Candi coming in at a close second, but Hop Lips is high on my list. Any IPA lovers living or traveling through Delaware should give her a shot. She just may be your kind of girl. Four breweries from Delaware will participate in the Mid-Atlantic edition of Sierra Nevada’s Beer Camp being held on August 2nd at Penn Treaty Park, Philadelphia. I’d like to thank Chris Crabb for sending this information my way. Beer Camp Across America Update! Four Delaware breweries have signed on to join fellow brewers and beer lovers at Sierra Nevada’s Beer Camp Across America, an unprecedented traveling beer festival that will take place later this summer. Nearly 700 craft brewers from around the country have already signed on for the multi-weekend event; anticipating more than 1,300 total craft beers on tap, collectively representing almost every state in the union, Beer Camp Across America promises to be the largest craft beer celebration in history.Delaware’s own Stewart’s, Dominion, Twin Lakes & Argilla are all making the trek to the Mid-Atlantic edition, taking place August 2 at Penn Treaty Park in Philadelphia. We’re hoping you’ll share Beer Camp Across America with your readers so that even more people will know about this monumental adventure and start making travel plans! Beer fans are snatching up tickets for each of the seven events at www.SierraNevada.com/BeerCamp (see schedule below). Each festival will feature up to two beers per brewery, food vendors, and live music by the MarchFourth Marching Band spectacle. Let me know if you have any questions or if I can provide further information. Cheers! • Sat, July 19th: Northwest Edition at Sierra Nevada Hop Field in Chico, CA, 12-5 p.m.
• Sun, July 20th: Southwest Edition at Embarcadero North in San Diego, CA, 1-6 p.m.
• Fri, July 25th: Rocky Mountain Edition at Civic Center Park in Denver, CO, 5-10 p.m.
• Sun, July 27th: Midwest Edition at Navy Pier in Chicago, IL, 12-5 p.m.
• Fri, August 1st: New England Edition at Thompson Point in Portland, ME, 5-10 p.m.
• Sat, August 2nd: Mid-Atlantic Edition at Penn Treaty Park in Philadelphia, PA, 12-5 p.m.
• Sun, August 3rd: Southeast Edition in Mills River, NC, 1-6 p.m.